EPISD has a real problem. In EPISD–some real numbers we pointed out that taking ten cents out of the interest and sinking fund rate and giving it to the operations and maintenance fund would leave the district without enough money to make their bond payments. The district failed to mention that to the voters. The voters approved the move. The district will have to add at least seventeen cents to our interest and sinking fund rate next year. That will not trigger a rollback election because state law allows them to raise the rate up to fifty cents per hundred without being subject to a taxpayer rollback effort. Without more money in the interest and sinking fund account the district will not be able to honor its obligation to the bond holders. That could cause a bond default. 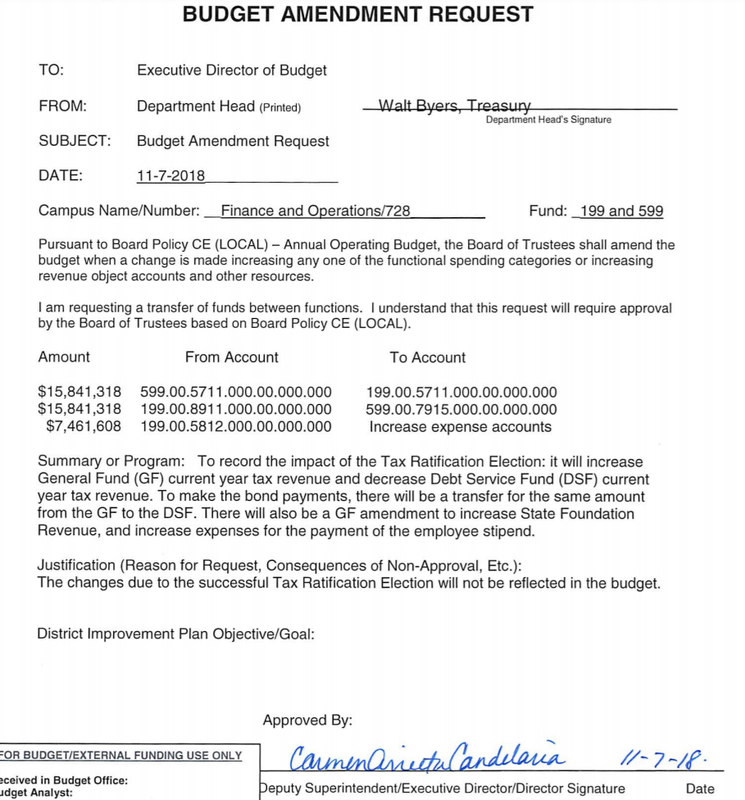 The document says “To make bond payments, there will be a transfer for the same amount from the GF (general fund, or operations and maintenance fund) to the DSF (debt service fund, or interest and sinking fund)”. “Districts do not have authority to increase the maintenance and operations tax rate to create a surplus to pay debt service with maintenance and operations tax revenue”. Their actions appear to be illegal. This entry was posted on Wednesday, November 21st, 2018 at 6:41 AM and is filed under El Paso Independent School District, State Government. You can follow any responses to this entry through the RSS 2.0 feed. You can leave a response, or trackback from your own site. 7 Responses to EPISD–will they get caught? Next you’ll say there is gambling going on in Casablanca. I’m shocked I tell you. Shocked. Not to try to sound negative about everything, but this makes me negative about everything. I suspect that much of what Cabrera and his “Creative Accountants” at EPISD do is “Illegal, FRAUD”. And still when they come up with a scam, Con, shell game to take MORE money from US, the uneducated who still believe the Con “It’s for the children” vote for it. Can’t trust these people. No different than City Hall, County Commissioners, the “Unelected” in El Taxo. They will TAKE, steal all they can from US and people still vote to give them MORE. I always vote “NO”, because with the Mayor, City Council, Commissioners, Cabrera, EPISD, there is ALWAYS the “lie, the hidden”, they didn’t “explain”. El Taxo and the Society of inherent corruption. The only POLITICS that ever “change” , are the names of the people who lie, deny, deceive. Who will catch them? They lied on the penny swap mailer but no one did anything…Which set of local officials is not in on the game? CFOs are supposed to know this stuff. Some know and think the rules do not apply to them.